A prosperous merchant named Zeno of Citium set sail with his merchant ship loaded with valuable cargo. In a terrible storm, the vessel sunk and Zeno himself almost perished. He washed up in Athens with nothing but the clothes on his back. Instead of falling into despair, he seized an opportunity. Athens was a hotbed for philosophy and Zeno, who had heretofore never considered such a pursuit, decided to learn more. He attached himself to teachers and books and soaked in knowledge. In time he founded his own school which became the most influential philosophical tradition of the ancient world and persists today. Some professions and roles acutely experience the challenge of dislocation. Those in the military, along with their spouses and children, for instance. However, every one of us will experience a sense of becoming “lost” at one point or another. Of being thrown into an unfamiliar location, circumstance or situation, or just losing our way. It is natural to feel anxious when what is familiar, maybe even comfortable, is taken from us and we are forced to come to terms with the unfamiliar. But we don’t have to let that lead to anguish or anger. There are always opportunities in misfortune. In 1965 James Stockdale’s plane was shot down over Vietnam. During his eight years as a prisoner, Stockdale sent letters to his wife, Sybil, who realized that they were coded. She coordinated with the CIA to continue communication while he was held captive in Vietnam. This correspondence reported deplorable prison conditions, described brutal torture and provided a list of the American POWs in Hanoi. The Stockdales accepted and embraced separation and misfortune and turned a trial into a triumph. It begins with our perception. We don’t control what happens to us, but we do control how we choose to see and engage with it. 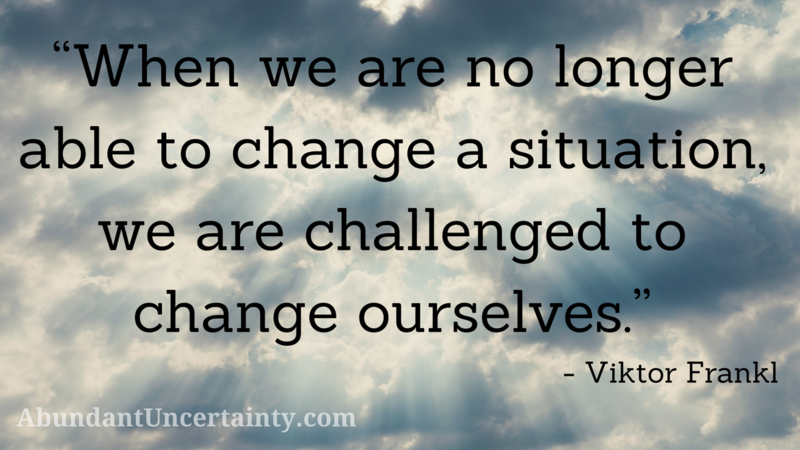 We may experience uncertainty, maybe even fear; but we don’t have to act on those unhelpful emotional responses. And we don’t have to face these things alone. Choosing our friends and mentors wisely will facilitate and expedite better decisions and actions. Those we surround ourselves with can help check our thinking, bolster our spirits, and aid our efforts. You can do more and better with the talents you already possess in any situation or circumstance and serve others well at the same time. Go do that. Do it now. Scott and Lisa live in beautiful Floyd, VA where they raised two boys and more than a few eyebrows! Scott is a teacher, author and musician. Lisa is a certified health coach, writer, and artist. Together they live abundantly through life's uncertainties and inspire others to do the same. Join a community sharing lessons and resources for living bolder, more connected, and thriving!